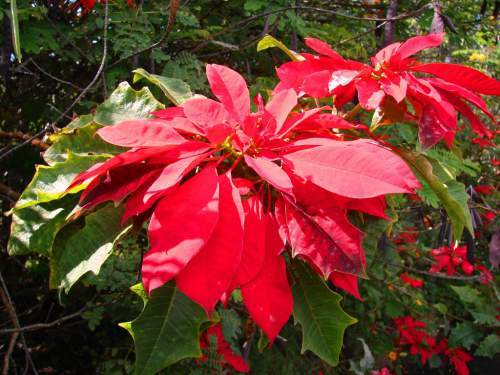 Poinsettias are native to Mexico and Central America and can be kept indoors as house plants or, in our mild climate, be utilized as colourful landscape shrubs, easily reaching 2-4m. 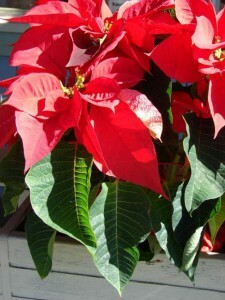 A poinsettia can look quite lovely when planted with foliage plants with contrasting leaf color, shape, and/or size. 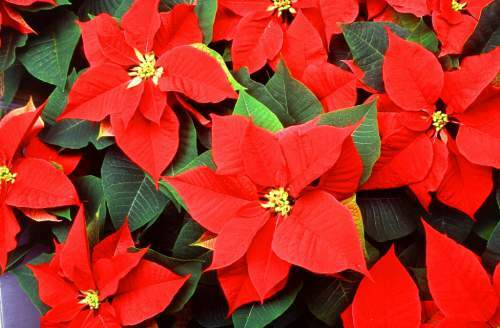 Poinsettias or Christmas stars (Euphorbia pulcherrima) are a widespread Christmas tradition both for gift-giving and holiday decorating. Yet many of these lovely plants end up in the trash once the holidays are over. But your enjoyment of these charming plants does not have to end when the Christmas tree comes down. 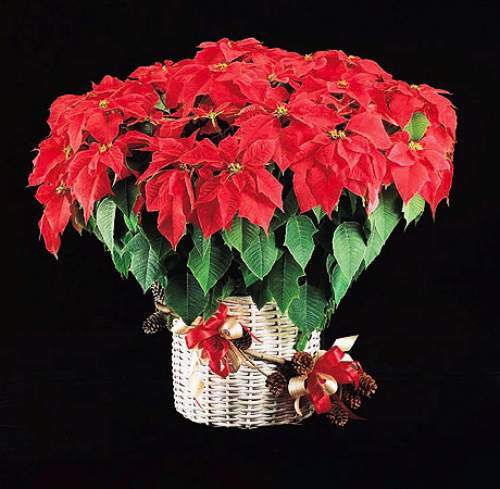 With just a little effort, you can derive pleasure from your poinsettia all year long and bring it to bloom for many holiday seasons to come. 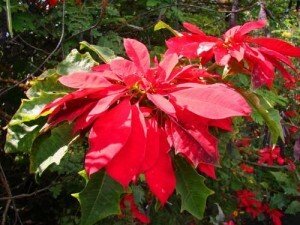 The most popular colour in poinsettias is red. However, there are numerous shades of whites, pinks and colour combinations. 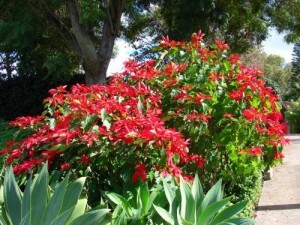 When in bloom, they display brightly coloured bracts on the top of each stem. Although many mistakenly think that these bracts are flower petals, the actual flowers are the tiny yellow clusters found at the center of the bracts. Another common misconception is that the plant is poisonous. 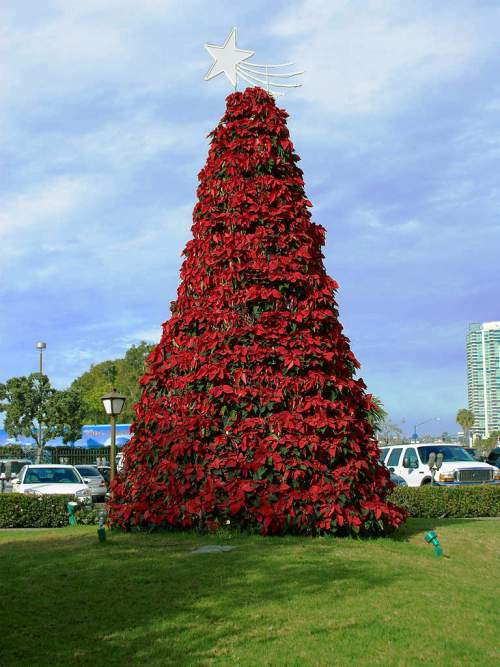 Like most euphorbias, the sap is a little caustic and may cause skin irritation and, if eaten, poinsettias may sometimes cause diarrhea and vomiting in animals and humans. 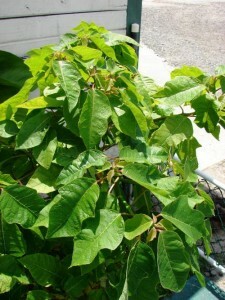 Select a plant which has green foliage nearly to the soil line. Old plants will usually have experienced excessive leaf drop. Foliage drop is also caused by fluctuating temperatures, gas fumes, soil problems and plant pests. The bracts should be large and extend over the lower green foliage. Select only plants with small, tight, green, button-like flower parts in the center of the bracts. If the flowers are already open and producing pollen, you can be assured that a portion of its useful display life has already passed and the bracts will begin to fade. Protect it during transport. Even short exposure to cold and wind can damage your new poinsettia plant before it is even home. After flowering, gradually decrease watering until the bracts all drop, cut the plant back by a third (remember gloves if you have sensitive skin) and then allow the plant to dry out completely. When it really begins to warm up again you can start to water and fertilize gradually. If your poinsettia is in a pot, this is a good time to repot it with fresh soil or plant it in your garden. Poinsettias like lots of bright light and are best placed in a sheltered position where they receive full morning sun and partial shade in the hot afternoon hours. They do not tolerate frost, but can survive short periods below zero. As for watering, it is important to allow the plant to drain out any excess water and let the soil dry out between watering. Having a poinsettia sit in water will harm the plant as it prefers moist soil to direct water. 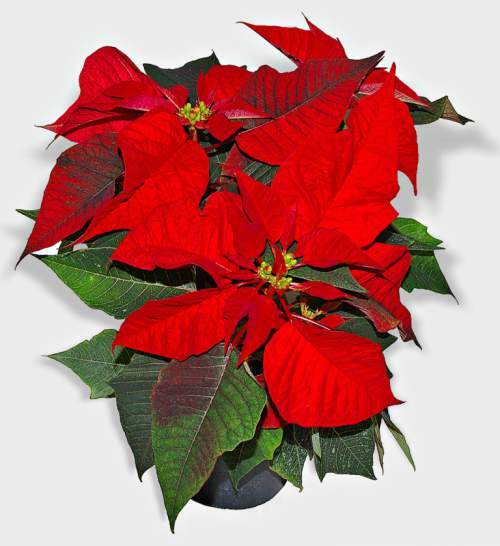 Poinsettias are sensitive to extreme temperature so, as a house plant, do not place your plant next to a heater or near a drafty window or doorway. During the summer you can nip off some of the shoots to encourage more flowers, but never prune the plant after August if you wish to force it to bloom for Christmas. To Turn Poinsettias Red Again. Restoring a healthy green Poinsettia plant from last year back to its original red color is no problem if you follow a few simple rules. Poinsettias (Euphorbia pulcherrima) need total darkness, for 14 hours each day, starting about eight weeks before you want to display them. Poinsettias can be difficult to induce to reflower after the initial display when purchased. They bloom in response to shortening daylight hours and require a period of uninterrupted long, dark nights in autumn in order to develop flowers. Incidental light at night during this time will hamper flower production. If you wish to coax your poinsettia to bloom in time for the holidays, you will need to put the plant in total darkness for about fourteen hours each night for at least 6 weeks, so mid September is a good time to begin this regimen. If your plant is in a pot you can easily place it in a cupboard or a closet to achieve complete darkness, and if it is in the garden you can cover it with black plastic or a large cardboard box. After the 14 hours of darkness the plant must be brought out during the day and receive lots of bright light. Getting a poinsettia to reflower is quite a challenge, but great fun when you succeed. 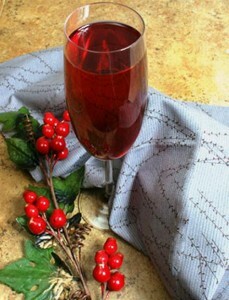 Did you know that there is also a popular Christmas and New Years cocktail called Poinsettia? Try serving this cocktail during the holiday festivities – I guarantee you it will be a success. Serve ice cold in a champagne glass, or with ice cubes/crushed ice in a long drink glass. Decorate with floating cranberries, orange/lemon slices or mint. Spain Info poinsettias, San Francisco De Asis, Urb Marina, San Fulgencio, 03177, Alicante, Spain.38n21, 0w29.